No fight for first place today. I've been in to town and back already. Evens up then odds down for a quick solve. Good morrrr… ning all… l... l... ll! What a great tip for solving, Plum - worked purr-fectly, thanks! Everybody!! Fall makes me want to stay in my nice warm bed! Was 52 here this am. Will make 80 by this pm. Wendy for the photo of lovely flowers. I wish you all a perfect day! Morning all, beautiful flowers for the quick finish. I'm up early to watch the golf. Don't forget Wombat's poozle … comment #28 on the 22 of Sept.
2:00 Good morning one and all! Joyce - Thanks. But it would have helped if the name was Albatross Memorial rather than Marker. G'day Tricia - welcome to the asylum! We southerners are OK but the northern contingent is a bit of a worry. I wonder how that photo on Medium was taken. An image I found on Flickr, among other places, shows it on top of a pointy rock, not on a flat piece of ground. I was googling around to see if the last line was actually repeated 9no) or it was one of those odd things that happens with comments (yes). Thank you, Joyce! Yes & yes to you both Hal & Sarah - the caption called it the Albatross Marker, but also located it on the Cape of Good Hope on the tip of Africa rather than where it is … on Cape Horn on the Tierra del Fuego archipelago of southern Chile - that's why it took me forever to find all about it! Sarah - it was not any odd thing, it was odd me! After I copied the poem, the last line was missing so I copied & pasted it to complete the poem. No one was more surprised than I to see it appear twice after I posted it! Welcome Tricia, not it always good to welcome a Kiwi to the site. The only Kiwi who has been on the site is Mads (you could contact her through this site). It is a tradition that if you can claim post 33 you can get a bottle of beer. I don't know any NZ beers, so I'll plump for a Cascade Light. 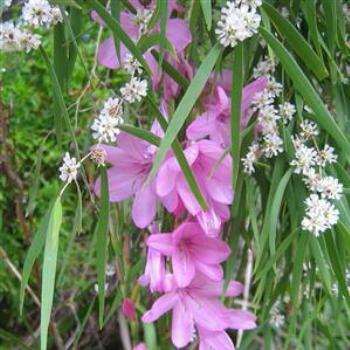 Soooo, a Watsonia is a cousin to a gladiola... in fact it is called 'Gladiola's Low-Care Cousin'! I've never particularly liked gladiolas - they seem so perfect & formal, but that Watsonia looks rather care-free! Interesting solve solution, Plum. Thanks. I don't know how a 'not' crept into my welcome Tricia, but it was definitely not intended. End of page one. Cris did you take part in the Fun Run?